COMMENTARY ON "JUSTICE AND MERCY IN THE OLD TESTAMENT: PART 2"
This week’s lesson again focusses on the Old Testament to make the point that the church is to serve and care for the poor, needy, and marginalized. It uses Old Testament prophecies from Ezekiel as metaphors picturing the effect of the church’s care and good deeds as it reaches into the world. It uses prophecies from Isaiah and Micah as mandates for the church’s good deeds to the needy. Then he brought me back to the door of the temple, and behold, water was issuing from below the threshold of the temple toward the east (for the temple faced east). The water was flowing down from below the south end of the threshold of the temple, south of the altar. Then he brought me out by way of the north gate and led me around on the outside to the outer gate that faces toward the east; and behold, the water was trickling out on the south side. Then he led me back to the bank of the river. As I went back, I saw on the bank of the river very many trees on the one side and on the other. And he said to me, “This water flows toward the eastern region and goes down into the Arabah, and enters the sea; when the water flows into the sea, the water will become fresh. And wherever the river goes, every living creature that swarms will live, and there will be very many fish. For this water goes there, that the waters of the sea may become fresh; so everything will live where the river goes. Fishermen will stand beside the sea. From Engedi to Eneglaim it will be a place for the spreading of nets. Its fish will be of very many kinds, like the fish of the Great Sea. But its swamps and marshes will not become fresh; they are to be left for salt. And on the banks, on both sides of the river, there will grow all kinds of trees for food. Their leaves will not wither, nor their fruit fail, but they will bear fresh fruit every month, because the water for them flows from the sanctuary. Their fruit will be for food, and their leaves for healing” ((Ezekiel 47:1-12). We see that, in context, verses 7 and 9 are specifically part of a passage that describes the coming kingdom. 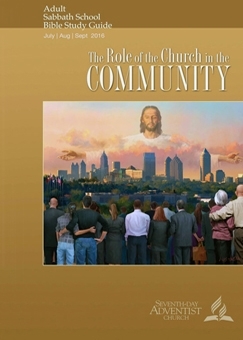 It is not a metaphor or an allegory describing the effects of the church. In fact, this entire passage is a prophecy, not a figure of speech describing the church. It is describing what will happen one day when the Lord reigns from Jerusalem, when living water flows out from the temple where He reigns and where even the desert land and the Dead Sea will come to life because the Lord Jesus has removed the curse on the earth and keeps His original covenant promises to Abraham, that He would give him Seed, land, and a blessing. It is illegitimate to use this prophecy as a metaphor for the effects of the church. While it is true that life and blessing flow from the Lord Jesus outward through His people and into the world, this fact does not negate the reality that this prophecy is not about the church. It is, rather, a statement of what the Lord Jesus Himself will bring about on this earth when He reigns. Sunday’s lesson refers to Ezekiel’s prophecy of the dry bones and says that this prophecy is only fulfilled when people become alive in Christ. The problem with this lesson is that it does not explain how one becomes alive in Christ. It talks about having faith in Christ and says that one’s peace would be in proportion to one’s faith and trust. It then ends with an ellen White reference that good works of mercy and charity are “fruits of faith”. What is missing is any mention of the cross, of Jesus’ full and complete atonement for sin, and of His resurrection that gives us spiritual life (Rom. 5:10). Adventists often assume their readers are “accepted” and are “Christian”. But unless one has confessed his sin and trusted Jesus as his full and complete atonement for sin, he cannot become alive in Christ. Merely mentally assenting to a belief in Jesus is not trusting Him. One cannot do good works that have any eternal merit at all unless one is alive in Christ by repenting and believing and being born again of the Spirit. As stated above, this passage is not a symbol of the church. While some applications may ultimately be drawn from this prophecy, it cannot be used as a symbol of the church. It has a specific meaning to the first audience, and in the light of context and also of other passages in Scripture, this passage is eschatological. It must be read as a prophecy of the future in the kingdom, not as an example of how to live as Christians. Using this passage as a guide to Christian living is a misapplication of the Bible. This is an illegitimate use of Scripture. To be sure, one may conclude that the Lord Jesus redeems creation and restores life, but this prophecy cannot be used as biblical support for a social gospel. Again, this lesson omits the gospel. The church is NOT the source of life to a dead world. The Lord Jesus is the Source of life. Acts of mercy and grace from Christians do not bring life to the spiritually dead. Moreover, Adventists cannot claim automatically to be Christians. Without believing in the biblical gospel that believing in the death, burial, and resurrection of the Lord Jesus for the personal payment of our sins—Jesus and NOTHING else, we cannot call ourselves Christians. Christians are not people who say they believe in Jesus; Christians are people who have been born again. Christians bear the literal presence of Jesus in the world through the indwelling Holy Spirit. They may bring unbelievers to an awareness of their own need for a Savior, but the good deeds are not what effect this awareness. It is God alone who is responsible for salvation, never us. We do not do things that bring others to faith. We minister and make disciples as His disciples, but our acts of obedience do not change people from death to life. The kindness of true Christ-followers may bring people to a place of recognizing their need for a Savior, but the acts themselves do not bring abundant life in Jesus. Moreover, the “wholistic Seventh-day Adventist message” is not the gospel, and it does not bring life. The Adventist “church” is not a healing river but a terrifying deception under the surface that looks so good. Today’s lesson draws from the book of Isaiah, chapter 61:1-11. This is the passage from which Jesus read when He was in then synagogue at Nazareth and told the people that on that day the passage was fulfilled in their hearing. Again, the lesson misinterprets this prophecy. Jesus said that the first verse and the first part of the second verse were fulfilled in Him. He Himself ushered in the Jubilee when all debts were forgiven and the brokenness and captivity of sin was removed through His blood. The remainder of the chapter describes the results of Jesus’ fulfillment of this prophecy. Because of His sacrifice, those who would believe and be forgiven would be blessed. Again, the bulk of this chapter describes the future kingdom in which God people, first the Jews and then the gentiles who accepted the truth about Jesus, would be honored and blessed in the kingdom of God. This passage is a statement of God’s sovereign faithfulness to bring all His promises to pass. He would not simply grant His people Israel the prosperity He promised for keeping the Mosaic covenant; He would provide the True Israel in the person of the Lord Jesus to fulfill all righteousness, to keep the covenant, to be the covenant sacrifice and propitiation of sin, and to usher in the new life in Him of forgiveness and of being born again. As true born again Christ followers, God’s people will be glorified. They will reign and be priests and ministers of our God among the nations. This is not a passage teaching a social gospel. That application completely eclipses the majestic reality that God is faithful to Himself and keeps His promises. He, not we by our good deeds, will bring the kingdom and will honor those who honor Him. Today’s lesson uses Micah 6 to emphasize that “external forms of religion” are unacceptable to God. It continues by giving the story of two families who moved into a deteriorating neighborhood, started a house church, demonstrated Christ’s love, and changed the community because Christ worked through His people. Without denying that God does work through His people, Micah 6 is not a proof text for community development and restoration through Adventist house churches. The lesson includes a quote by Ellen White that says, “Practical godliness is the only kind of religion recognized at the judgment bar of God” (Matt. 25:34-36). The “godliest” of deeds will be unacceptable to God is one doesn’t know Him. Unless one is born again, he cannot enter the kingdom of heaven. Even the work of doing miracles and casting out demons in Jesus’ name will not count as righteousness unless God knows them—unless His Spirit indwells them as His seal of their faith and trust in Him. When we believe in Jesus and His Sacrifice for our sins, we pass at that moment out of judgment. Until we believe, we are condemned. In fact, we are born condemned (Eph. 2:1-3). We don’t do good deeds in an effort to demonstrate our loyalty to Jesus. On the contrary; we repent before Him and accept His sacrifice for us. We cannot do good unless we know Jesus and are born again. Good deeds may make a difference in an community, but altruism is temporary. Eternal significance is the work that flows from a born again heart that brings the true biblical gospel into people’s lives. Lifestyle and wholistic Adventist messages are not the gospel, nor do they reveal the gospel. Only God’s word can provide the words that give life. While these words are true, they are incomplete. From an Adventist perspective, Jesus’ sacrifice on the cross was only part of what’s necessary to live obediently. In fact, within Adventism, the cross is a bit secondary…or slightly blurry behind the altar of lifestyle and good deeds. In Scripture, however, the cross is central because it was there that Jesus bought us back from death. He fulfilled the curse of the law and the commandments that were against us and died to break death wide open. He rose on the third day, and 40 days later, His disciples believed and received the indwelling Holy Spirit on the Day of Pentecost. When we are born again, we are new creatures. We thank Him for the cross, but we aren’t living our lives fulfilling the deeds of a social gospel. Rather, we spend ourselves delivering the good news of the sufficiency of the Lord Jesus and his death, burial, and resurrection. Good deeds are only the natural outflow of the heart that is born again. The good works God created in advance for us to do (Eph. 2:10) are the works of faith and ministry that God Himself gifts us to do and brings to us. The Old Testament is not a picture of the church. It is written to Israel for Israel, and in the New Testament we find much of the Old Testament restated to show how God has fulfilled it at least in part as the gospel has gone throughout the world. But it is God, not we ourselves, that do the work of the kingdom. We serve the King and care for His body. Copyright 2016 BibleStudiesForAdventists.com. All rights reserved. Revised July 18, 2016. This website is published by Life Assurance Ministries, Camp Verde, Arizona, USA, the publisher of Proclamation! Magazine. Contact email: BibleStudiesForAdventists@gmail.com.